White House Petition For George Soros To Be Labeled A Terrorist Is ON FIRE! George Soros funds Antifa, Black Lives Matters and many other hate groups that are trying to actively take our President and America down. He is a known destroyer. He is a globalist filled with hate. That is why Democrats love him. Can you actually see the DOJ moving to seize Soros assets? TGP: A 10-day old White House petition to declare Leftist billionaire George Soros a terrorist is quickly becoming one of the site’s most popular, with nearly 60,000 votes. Law Newz reports: According to the Whitehouse.gov website, a petition to declare George Soros a terrorist and seize all of his related organizations’ assets under RICO and NDAA law” is one of the most popular White House petitions. It is ranked number 12, pulling in about 60,000 thousand signatures since it was created just 10 days ago. 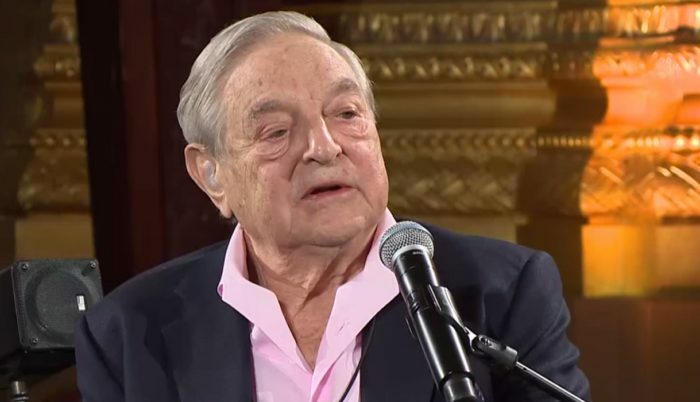 Thee DOJ should immediately declare George Soros and all of his organizations and staff members to be domestic terrorists and have all of his personal an organizational wealth and assets seized under Civil Asset Forfeiture law. Recently, the Washington Free Beacon published a lengthy document from far left operative David Brock, the founder of Soros-funded Media Matters website, from a January donor retreat. The 49 page memo outlines how the George Soros-funded groups Media Matters, American Bridge, Citizens for Responsibility and Ethics in Washington (CREW) and Shareblue plan to undermine President Trump’s agenda and help Democrats win control of Congress and the White House by 2020. The document claims Media Matters is working with Facebook and Twitter to crack down on pro-Trump articles on social media.